Miss California Crystal Lee with a short stack and bacon. Miss California 2013 Crystal Lee (aka Miss America 2014 First Runner-Up) made two appearances at two Bay Area IHOP locations, one in San Francisco’s Fisherman’s Wharf and the other in South San Francisco near SFO. Crystal spent her time at these locations greeting customers at the door, meeting with customers at their tables, and thanked those that made contributions. Crystal even ate a pancake at the San Francisco location. Photo of Miss California with a pancake mountain from her Facebook Fan Page. Since beginning its National Pancake Day celebration in 2006, IHOP restaurants have raised $13 million to support charities in the communities in which they operate. On March 4, 2014, guests from around the country will once again celebrate National Pancake Day at IHOP restaurants and enjoy a free short stack of Buttermilk pancakes. In return for the free pancakes, guests will be asked to consider leaving a donation for Children’s Miracle Network Hospitals© or other designated local charities. 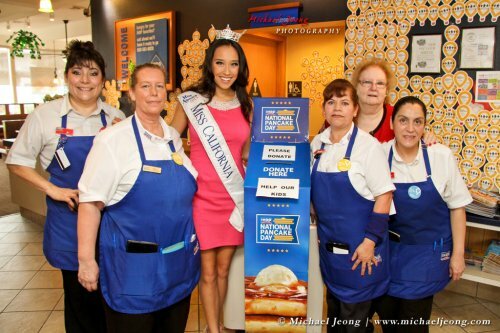 Miss California Crystal Lee with IHOP staff members. Children’s Miracle Network Hospitals® raises funds and awareness for 170 member hospitals that provide 32 million treatments each year to kids across the U.S. and Canada. Donations – including all those made on IHOP National Pancake Day – stay local to fund critical treatments and healthcare services, pediatric medical equipment and charitable care. Since 1983, Children’s Miracle Network Hospitals has raised more than $5 billion, most of it $1 at a time through the charity’s Miracle Balloon icon. Its fundraising partners and programs support the nonprofit’s mission to save and improve the lives of as many children as possible. Find out why children’s hospitals need community support, and learn about your member hospital, at CMNHospitals.org. Crystal Lee, crowned Miss California 2013, dazzled America in September as she vied for the coveted title of Miss America 2014. This year’s competition was brought back to the place where it all started, Atlantic City, after having been hosted in Las Vegas for several years. Lee made it look so easy, and I learned through her that the journey to the competition had not been easy for her. In fact, it took three attempts on the state level before she was able to reach the national stage. Although Lee went through periods of disappointment and self-doubt, it forced her to accept failure, come up with a new perspective and plan of attack, and to develop an attitude of determination. Lee was born in San Francisco to an American-born Chinese father and Taiwanese mother. She was educated through San Francisco’s public school system and graduated from Stanford University with a B.A. in Human Biology and M.A. in Communication last June. She likes sashimi and enjoys outdoor activities such as backpacking, hiking, and camping. She also loves to read up on the latest technological developments and dreams of starting her own company one day by developing a great product or service. Ever since Lee was a young girl, she was always interested in pageants. She remembers moments like watching the Chinese New Year Parade and seeing Miss Chinatown wave from her float. Lee started her years in pageantry at the age of 15 when she entered the Miss Teen Chinatown 2007 competition. The following year was crowned Miss California’s Outstanding Teen 2008. A couple of years later, Lee was crowned Miss Chinatown USA 2010. Determination in mind, Lee had her eyes set on Miss America, but the road to get there proved quite challenging. Crystal was crowned Miss San Francisco 2011, but placed in the Top 12 of that year’s Miss California competition. The following year, Lee was crowned Miss South Counties and had another attempt at reaching the national stage, but came extremely close as she was runner up to 2012’s Miss California Leah Cecil. Lee’s persistence paid off on her third attempt as she was crowned Miss Silicon Valley and was on her way to compete for Miss California again in Fresno, where she was finally crowned Miss California 2013. Throughout the years, several role models have influenced Lee for various reasons: Rose Chung, pageant director, for her ability to organize the community and mentor hundreds of young women across the SF Bay Area. Jan Yanehiro, broadcast journalist, for pioneering the Asian American face in the media. Lastly, Lee’s mother has always been a huge support for Crystal as she encouraged her to dream big, aim high, and work harder than she could have ever thought possible. Oftentimes, people tend to think that pageantry is not a sport, but in fact it is more than a sport. It requires not only the physical and mental demands of a sport, but also includes developing a mission for society or the community, showcasing a talent, and the ability to answer on the spot a question that could be extremely difficult, and most obviously, very stiff competition. Entering a competition with a large pool of other competitors can be seemingly daunting knowing that the odds to place are slim and the stress unimaginable. How did Lee deal with the preliminaries? Well, Lee was faced with over 60 contestants at the Miss California competition, but at Miss America there were 52. With that being said, she wasn’t as stressed in the Miss America competition; however, Lee did have to increase her level of competitiveness because the caliber of competition was greater knowing she was up against the best from each state/territory. Nevertheless, Lee was mentally prepared to do her best, no matter who she was up against. In an interesting twist of fate, another Crystal Lee from the state of Hawaii entered the picture. She was crowned Miss Chinatown Hawaii 2013 earlier this year and was eligible to move on and compete in the 2013 Miss Hawaii Organization program. In June, she was crowned Miss Hawaii 2013 and also competed in the Miss America Pageant. So with two Crystal Lees in the Miss America competition things must have been pretty interesting…, how well would they mesh. MJ: Were you shocked/amazed/amused that you were competing against another Crystal Lee of Hawaii? How did you both get along? CL: I found out a few weeks before I became Miss California and was thrilled to discover what a sweet, genuine girl she is. Interestingly enough, she was the contestant before me during preliminary competition so we sat next each other in the dressing room, and also stayed in the same hotel. MJ: What was your platform and why did you chose that? CL: I chose my platform, Women in S.T.E.M (Science, Technology, Engineering, and Math) for a few reasons: 1) it aligns with the Miss America mission to empower women and 2) it’s an issue that affects us all more than we realize. Young girls often think they’re less competent in science and math as the boys in their classes. As they grow up they tend to veer away from these majors, and it’s unfortunate because they lead to jobs that they need their perspectives, pay well, and solve crucial problems. Getting more Women in STEM would improve America’s industries. Everyone wins when we have more women leaning into these fields. MJ: What was your talent and why did you choose that specific talent? CL: I chose to perform a ballet en pointe piece called, “The Swan” and it depicts the final moments of a swan’s life. It’s a tragic and dramatic selection considering this was for the Miss America pageant, where most dancers chose high-energy, exuberant, and cheery talents. I wanted to share an experience of something deeper- the inevitable end that all creatures face, and the passion with which we cling on to life. After a couple eliminations and after all the segments of competition, there left two standing. Both remaining in the competition were Asian American. MJ: When Nina Davuluri and yourself were the last two contestants on the stage, what was going through your mind? Did that fact that both of you were Asian cross your mind as being a momentous part of history? CL: In those final moments, I was focused on the announcement of results and didn’t think about us being Asian. We’ve had a Chinese-American in the Top 2 before, but perhaps not an Indian-American, which may have been why Nina said something about it. I’ve always thought of myself to be just as American as I am Asian. Our country has always been composed of immigrant backgrounds- whether or not your appearance reflects it. The order in which one’s forefathers arrived doesn’t make their descendants more or less American. But stepping out of the competition, I now realize what a huge step this is for all Asian Americans. I can’t wait for the day we have a Chinese-American Miss America. I hope she’s bilingual, too! Although Lee did not take home the title of Miss America, she did become Miss America’s First Runner-Up. Following the competition, hateful comments were said over social media about the results of Miss America, what kind of effect did this have on Lee. MJ: What is your response to all the negative and racial comments that were said about Miss America Nina Davuluri? Did you receive any racial comments as well? CL: I haven’t received too many racial comments. I’m trying to be a lily pad this year- letting criticism roll right off like water off a lily pad. It’s sad that so many Americans don’t know how much they don’t know. It shows how far we have yet to go as a society. I’m glad the media publicly called out the perpetrators for their ignorance. It reinforces our commitment to acceptance and understanding. MJ: Also being of Asian decent, what do you think it will take for Americans to be more unified and to put aside our differences? CL: It will take time, and seeing movers and shakers of all ethnic backgrounds do great things. It’s easy to become complacent with the way things are, but the fact is we’re becoming a global world and the emerging generation seems more ready to put aside differences as we solve pressing problems. We need to encourage people of all backgrounds to step up and be leaders and role models. Once this becomes the norm, our so-called “differences” won’t seem so different after all. Now that the Miss America Pageant had concluded, what lies on the horizon for Crystal and what was her overall experience with the Miss America Organization. MJ: What’s next for you in the remaining year and/or years to follow? CL: I plan to continue traveling throughout the state for appearances and making the most of my reign. I’ve heard this year flies by quickly so I’m already getting the ball rolling on a few exciting projects related to STEM in Silicon Valley. I ultimately want to work in technology/startups so this is fitting preparation for my career ahead. MJ: What encouragement do you have for young girls and young women in America? CL: I’d encourage more young women to compete in the Miss America program. It’s an incredible opportunity for personal growth, scholarship money, and tons of lifelong friends and benefits. You get what you choose to get out of it- and the best part is, it combines the controllable with the unpredictable! It’s the best life preparation. MJ: How has the Miss America Pageant impacted your life? MJ: What were a couple of memorable experiences that you have gained with the other representatives of Miss America? CL: You might think the most memorable experiences would be the most well-documented ones (such as the telecast), but it’s actually the quiet moments that stand out most in my mind. The two weeks at Miss America are like being in a pressure cooker; we get to know each other really well because we’re together every waking moment. I’ll always remember how in awe I was hearing about the other girls’ community service projects. Miss South Carolina created a program to get more high school students applying to college. Miss Michigan, who lost her father when she was a child, has spent years helping other children cope with grief. I was really inspired by how committed these girls were to giving back. MJ: What is something most people don’t realize about the Miss America pageant? CL: We are essentially athletes. It’s just as mental as it is physical. Most onlookers think it’s all about how you look- but having been on the inside, let me tell you that how you think and how you act is equally important. At the national competition, every contestant is gorgeous and at her peak physical condition. Onstage, each girl can be as beautiful as the next. Where the judges select the winner is the interview. A magnetic personality and inner beauty takes you much farther than just having the prettiest face. One thing that would stay with me from my interview with Lee was her philosophy on her overall character. “It’s important to always be presentable, to give others energy and respect, and to behave knowing that you represent something larger than just yourself.” Nevertheless, not only is Lee’s philosophy a great motto, but a selfless act we should all put into practice. *Some portions of this interview has been omitted and order rearranged.